Warner Bros. Consumer Products (WBCP) with DC Entertainment (DCE) and The LEGO Group announced today the extension of their successful partnership to translate some of the world�s most popular DC Comics Super Heroes into the world of LEGO� build-and-play adventures with LEGO DC Universe SUPER HEROES. The multi-year licensing agreement grants the world leader in high quality construction toys access to the entire library of DC Comics characters and stories to inspire LEGO building fun. Construction sets, minifigures and buildable characters and creatures inspired by the universe of DC Comics are slated to launch in January 2012. The new LEGO DC Universe SUPER HEROES collection will feature 13 iconic super heroes in LEGO minifigure form, including: Batman�, Robin�, Catwoman�, The Joker, The Riddler�, Two-Face, Poison Ivy, Harley Quinn�, Bane, Bruce Wayne, Superman�, Lex Luthor� and Wonder Woman�. Buildable characters will include Batman, The Joker and Green Lantern. Select figures will be on display in the LEGO booth (#2829) at Comic-Con International at the San Diego Convention Center July 21-24. The company will revisit their previous successful collections like LEGO BATMAN� that also inspired the best-selling LEGO BATMAN: The Videogame, published by Warner Bros. Interactive Entertainment, which has sold more than 12 million units worldwide since its launch in 2008. 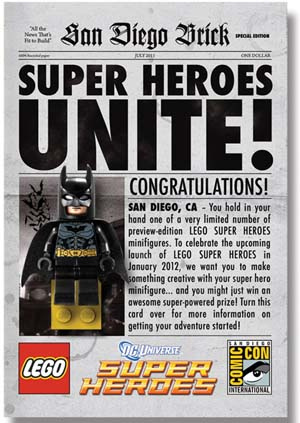 At San Diego Comic-Con, 3,000 exclusive Batman and Green Lantern LEGO minifigures will be distributed to kick off a promotion that will take place from August to December in advance of the launch. Fans are encouraged to use their collectible minifigures and existing LEGO collections to create original LEGO DC Universe SUPER HEROES adventures through video, photography or illustration, then share their submissions on www.LEGOSUPERHEROES.com. Entrants have a chance to win monthly prizes or a grand prize trip to California for exclusive tours of Warner Bros. Studios, WB Animation and LEGOLAND� California. Two of the world�s most iconic brands are joining forces as The LEGO Group, world leader in high quality construction toys, and Marvel Entertainment, LLC, a global character -based entertainment company, announced a wide ranging strategic licensing deal. Through the multi-year agreement starting as of January 1st, 2012, Marvel has granted LEGO Group the rights to develop a distinct Marvel branded construction toy collection � LEGO SUPER HEROES � which will bring the characters, vehicles and action of Marvel�s renowned universe to the world of LEGO� build-and-play adventure. The LEGO SUPER HEROES Marvel collection�s initial construction sets, minifigures and buildable characters are scheduled to launch in May of 2012. The LEGO SUPER HEROES Marvel collection will spotlight three Marvel franchises � Marvel�s The Avengers movie, and X-Men and Spider-Man classic characters. The LEGO Marvel�s The Avengers movie line brings such ever popular Marvel characters as Iron Man, The Hulk, Captain America, Thor, Hawkeye, Loki and Black Widow to LEGO minifigure form. The LEGO X-Men collection includes minifigure comic versions of Wolverine, Magneto, Nick Fury and Deadpool, while the LEGO Spider-Man sets offer minifigure comic versions of Spider-Man, and Doctor Octopus. The first buildable characters in the LEGO SUPER HEROES collection are highlighted by Captain America, The Hulk and Iron Man. Select figures will be unveiled in the LEGO booth (#2829) during Comic-Con International at the San Diego Convention Center July 21-24. The retail debut of the Marvel-inspired LEGO SUPER HEROES collection is timed to coincide with the highly anticipated Summer 2012 blockbuster movie release of Marvel Studios and Walt Disney Pictures feature film Marvel�s The Avengers. Oh man, I barely escaped Lego’s grasp when they had Batman and Spiderman licenses before. This will be a test of willpower.